We stood strong on that day, just like this little girl who was so thrilled with Tirzah’s signs. It was a day when I felt united and hopeful as Hutterite people. I feel we were investing in and inspiring exactly who we should be in this place; adults in exertion alongside children. Our aim was the same and could only be attained by investing in time and effort, whether you were an adult or a child. 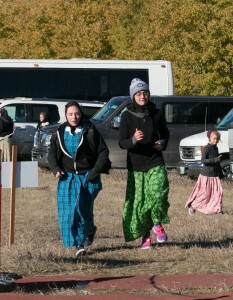 It was a grand event of 420 Hutterite people sharing a brilliant fall day on trails. 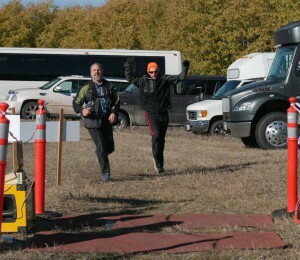 It started with glaringly bright sunlight and stingy cold fall air, but the people and event make you forget the cold. We bounced along the #2 highway on our bus, a fresh start to the day while watching the tangerine sun come up for us. Brave little children came. It’s not a small thing to brave this crowd of people and though they looked a little dazed by the huge crowd, they leapt through the crowded trails. Committed teachers and parents helped channel the crowd with instructions or simply responded to the needs of the moment, as parents and teachers do instinctively. Long-legged teenage boys thunder along the trail. Moms walk solid. Teenage girls chatter and cluster. I witness a healthy number of competitive clusters racing towards the finish line. The day would not have been complete without many of the regular faces that have committed themselves to the lifestyle of health and fitness. They took the time to share the day and trail with the young ones. One of those people is our Arnie Vetter from Silverwinds. His dedication to fitness is inspirational. The day is one I want to be part of for many years. It only gets better. 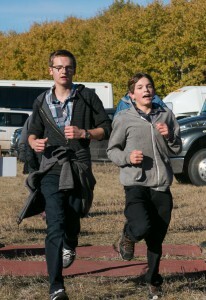 I love that there’s always new faces joining and it’s especially runderful when your best friends start running, too. Thank you so much Anna and Doris for coordinating this annual run. 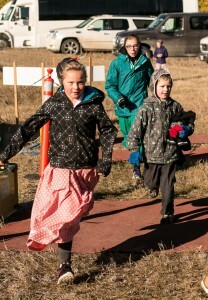 Hutterite children’s health and education is immeasurably valuable. What better way to celebrate both than running together with adults in the fall woods?